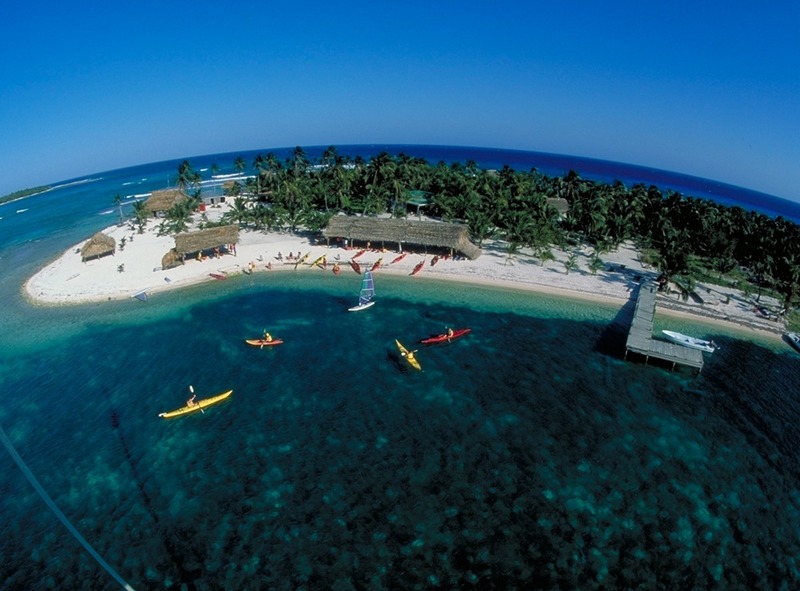 PICTURE YOURSELF ON A BELIZE PRIVATE ISLAND, forgotten by the world. Spend 6 days in Belize on this private island paradise. No 24/7 news cycle, no schedules, no problems. It sounds like a dream, but you can experience it yourself on Long Caye at Glover’s Reef, one of the best beach resorts in Belize. Each day we introduce a new sport (or three). We begin by snorkeling to a nearby patch reef. 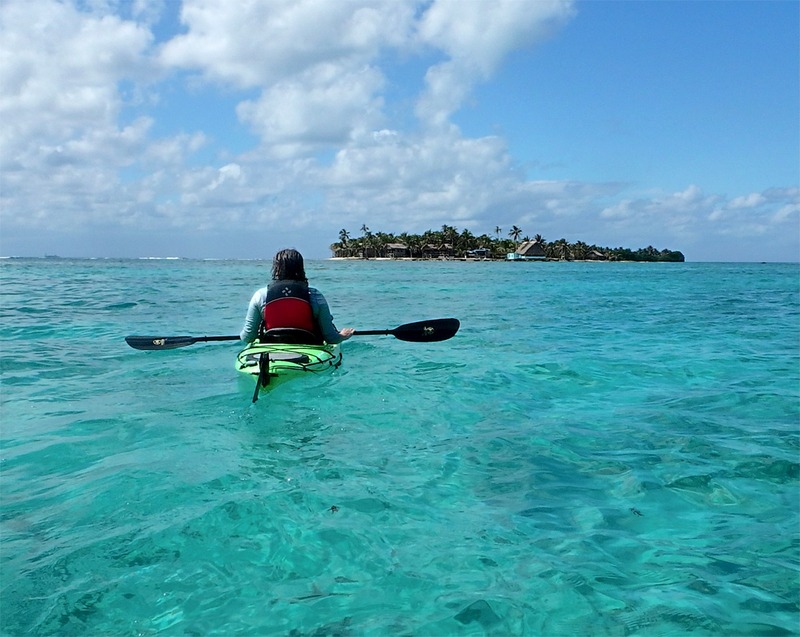 The next day we cover sea kayaking so that we can paddle to access nearby coral gardens. Another day finds us surf kayaking our wave which is just feet from our shore, or diving Long Caye Wall. At night we enjoy home-style Belizean food. 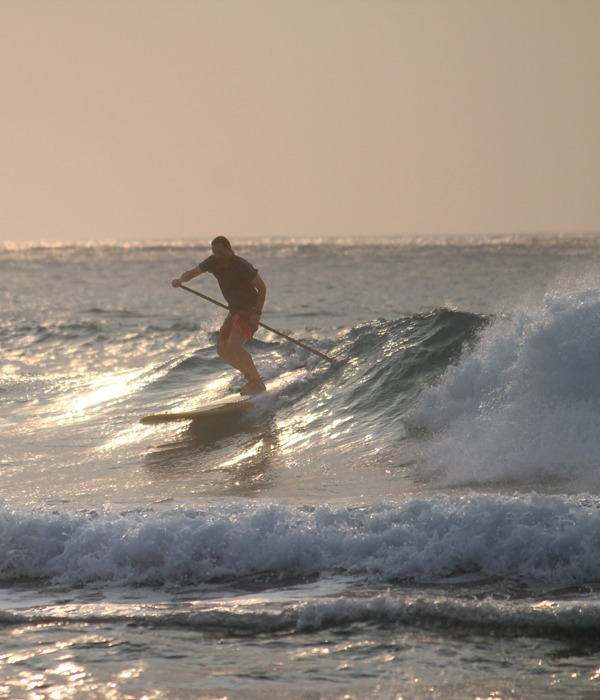 Even if you have never surfed before, you will be out catching a wave in less than an hour! 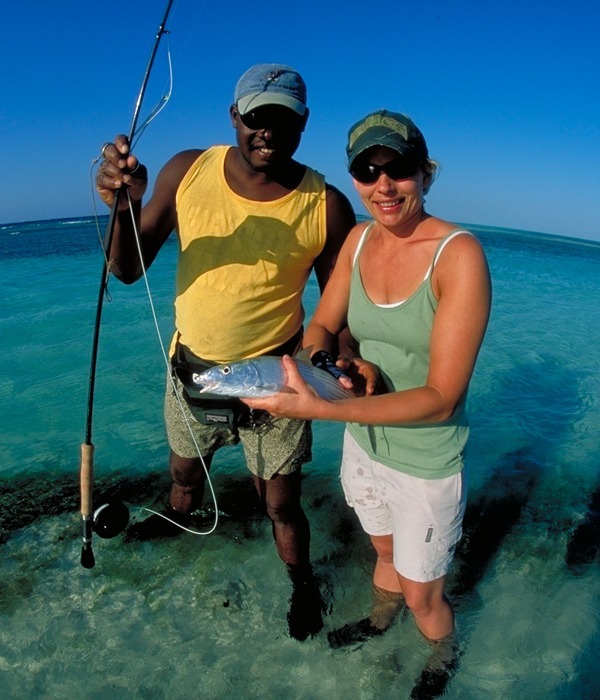 Slickrock spares no expense to ensure that our gear and guided activities in Belize are the best available anywhere. In addition to basing out of a remote, private island, our huge array of sports gear is rigged and ready to go, right on one of the best beaches in Belize. 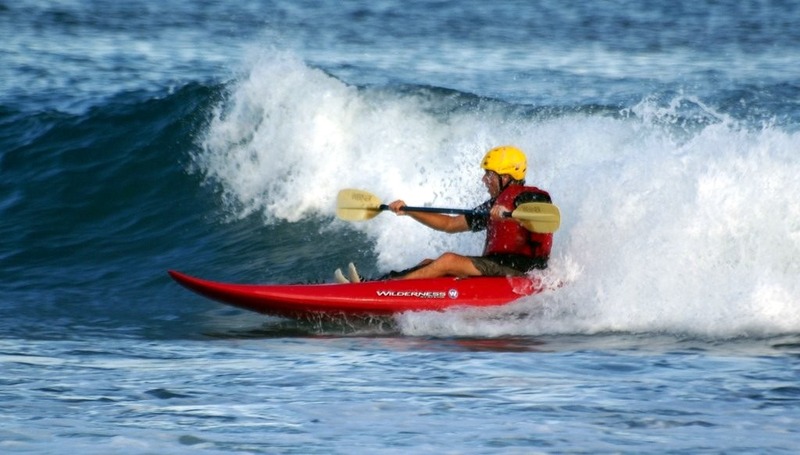 Our fleet includes surfboards, sea kayaks, fishing and surf kayaks, paddleboards, and windsurfing gear for all ability levels. 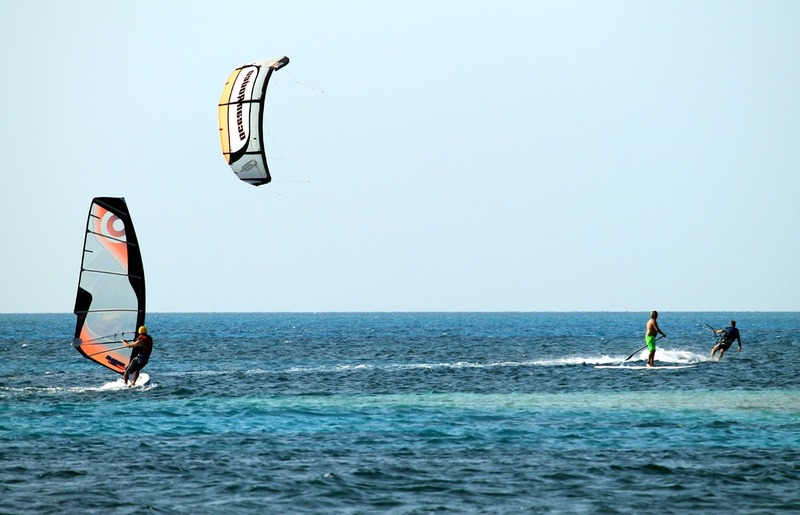 Our kitesurf center offers advanced lessons, and scuba diving is also available, with a full daily certified dive schedule, and certified dive courses from PADI Scuba Diver on up. When we say 10 sports in 6 days, we mean it! 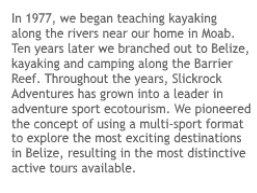 Our guides are among the best in Belize, read the glowing reviews to hear what past guests say about our island crew. 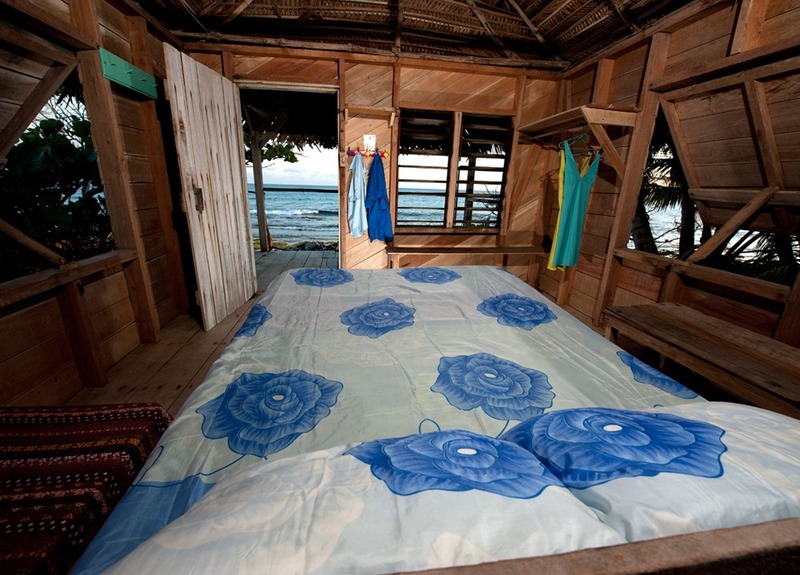 Our facilities are rustic, very private, and quite comfortable; each Belize beach hut is located right on shore. We have a rainwater collection system with purification for drinking water, air temperature showers, and ecologically-friendly composting toilets (we flush nothing into the sea). Our Belize island menu also receives rave reviews, our beer is cold, and included in the price (soda, too). Our private boat charter leaves directly out of Belize City. 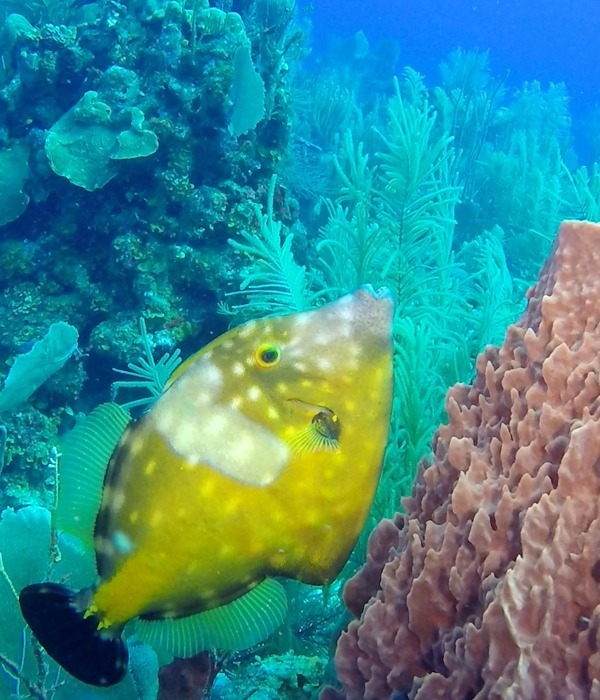 This half-week package is the first half of our Adventure Island at Glover’s Reef Full Week trip. This adventure is designed for those looking for an active vacation, but no experience is required, and you get to do whichever sports you prefer. Each activity is introduced, taught, and guided by expert guides, and is suitable for a complete beginner in decent shape. Hundreds of our guests have told us that this was the best vacation of their lives. Come see for yourself why 25% of our guests return, sometimes for multiple years! 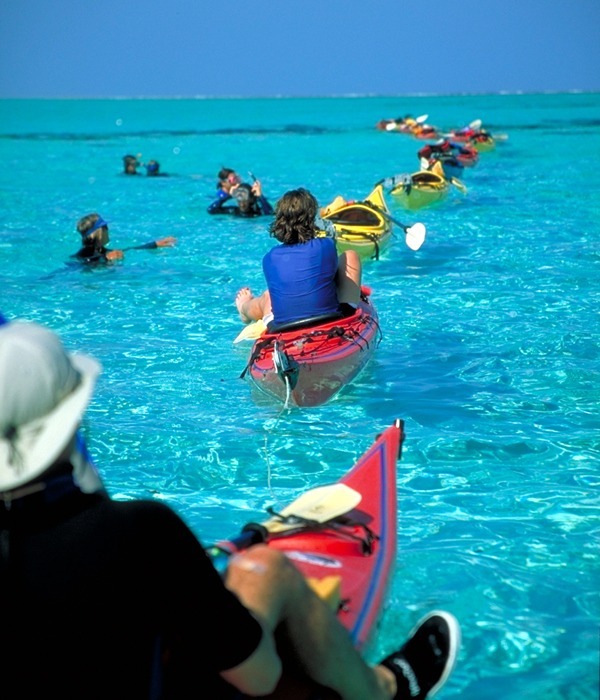 We started in Belize by offering kayak camping trips out of Placencia. Several years later we made the move out to Glover’s Reef Atoll when we were able to base from our own island. We wanted to create a resort that leaves the island in as natural a state as possible. Obviously if you build even one building, that is a level of development. But it’s hard to find a place like ours, where the island is mostly left as it was found… created by Mother Nature (with just a little bit of solar power to chill the beer). Our facility on Long Caye has sixteen cabanas, a solar-powered kitchen and water pumps, hammock and sea kayak palapas, a dock for watching the surfers at sunrise, dozens of kayaks, sailboards, surf boards, and surf kayaks, as well as the only kitesurf center at Glover’s Reef, Belize, and a full service dive shop (the only thing not owned by Slickrock). 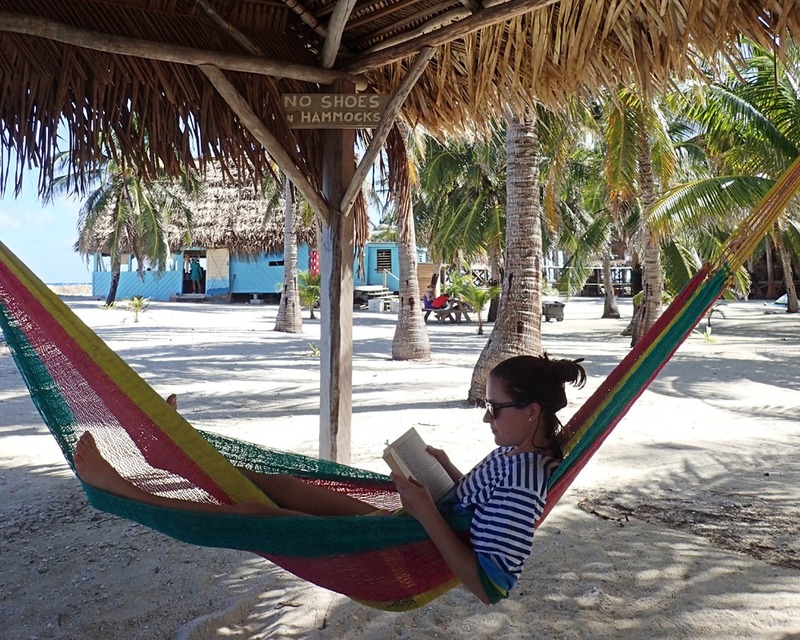 There is no maid service, wifi, air conditioning, flush toilets (as a true Belize eco lodge, we flush nothing into the sea) or ringing telephones. The tropical breezes keep the temperatures well below what they are on the mainland. But we do have the important things in life covered: a fridge permanently loaded with Fantas and Belikin beer, and beach cabanas that sit just feet from the breaking waves. It’s the best in adventure travel — right down to the Belizean guides who snorkel with you all day and then sit down with you to dine. 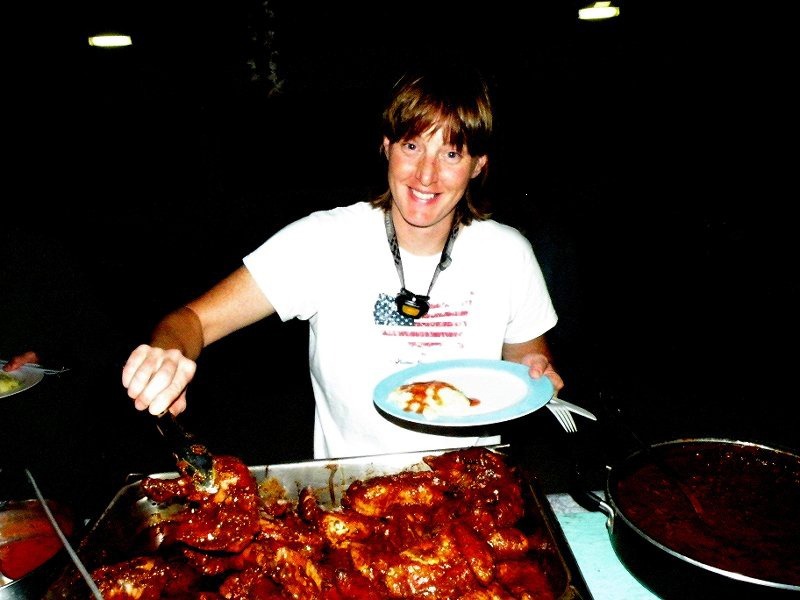 Depending on your past experience, our place will seem like either the most cushy camp or the most rustic resort you have ever been to. 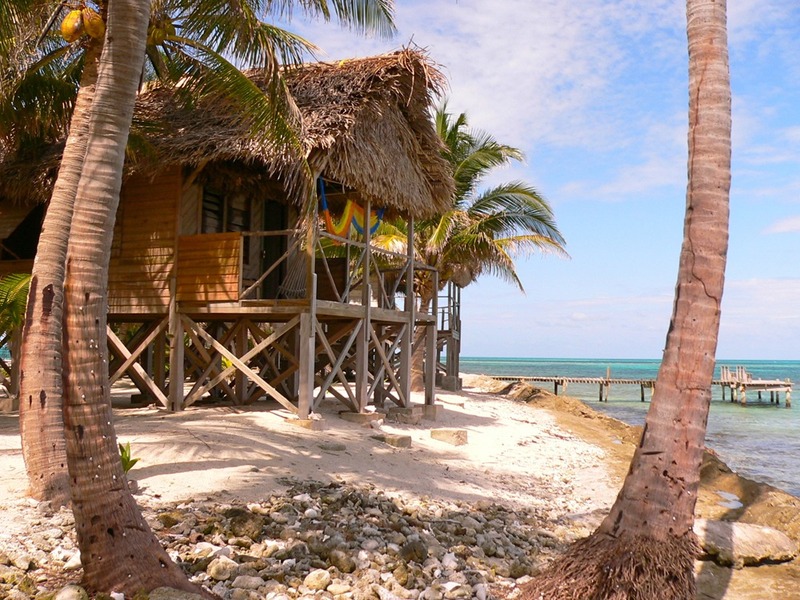 It’s more like Gilligan’s Island than the Belize Hilton. Every cabana has single or double beds, solar-powered lighting, and a hammock on the porch with your name on it. We drink purified rainwater, and we bathe with well water pumped by the sun (not heated, the showers are about 75-80 degrees). Composting toilets complete this ecologically friendly set-up. Our spacious island (13.5 acres) and comfortable facilities ensure your enjoyment without compromising the adventure of living on an undeveloped and uncrowded island. Best of all, you can stay active all day or read a book in the shade under a palm if you want. See our island amenities page for more information. Every Adventure Island experience includes a Digital Detox. No email or text messages! Wake to the sounds of tropical birdlife. Experience a wonderful thing: Island Time. Visit our Long Caye, Belize page for more photos and maps of the island. Related Blog Post: Atoll or Island. What is it? We meet and stay at the Belize Biltmore Plaza Hotel the first night of the trip, and also stay there at the end after coming off of the island. Guests are responsible for getting themselves there the late afternoon on Day 1, where we conduct our first trip meeting that night. In this way we are right by our dock to go out to the island the first thing the next morning, when ensures we won’t miss our boat to the island. At the end of the trip round trip Belize flights leave too early, so we don’t get off of the island in time to catch an international flight and we stay there again. Both the first and last night at the Biltmore are included in the trip price. 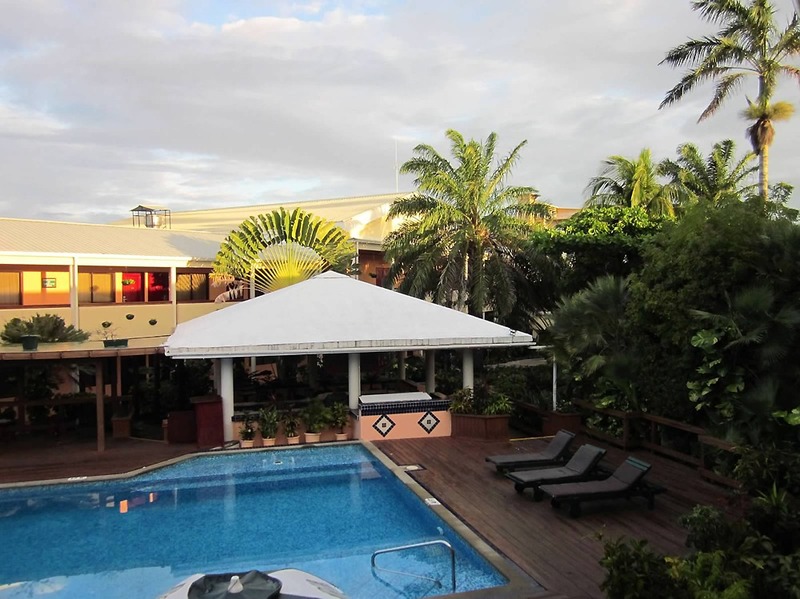 This is a full-service American-style hotel located in the outskirts of Belize City, not far from the international airport. With a business center, pool, restaurant, bar, gym, gift shop, tour desk, and internet cafe, it’s the perfect place for guests arriving early or staying extra days.